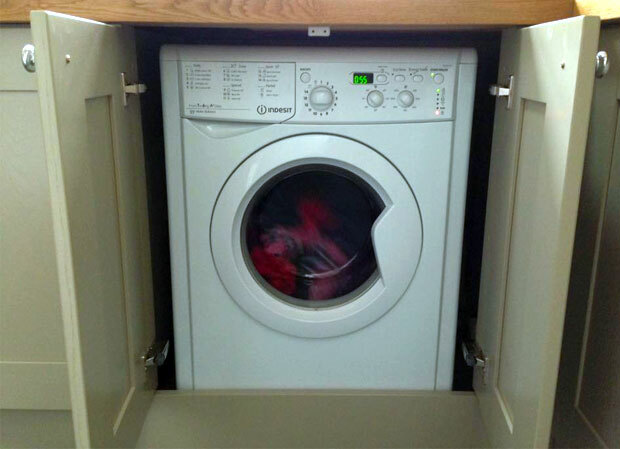 Home » Customer Questions » How do I integrate a washer & dryer in my utility room? Quite a popular question that we are asked is “how do I integrate my washer & dryer in my utility room?” Well, there are 2 ways in which you can do this and it all depends on if you are using integrated appliances or freestanding appliances, as both can be put behind doors to keep them out of sight. If the appliances you are using are fully integrated then these appliances just need space under a 600mm deep worktop and/or between base units, if they are being used. If your utility room is small and no base units are being used then you can baton a worktop to the wall, put 2 end panels either side of the appliances to give the worktop something to rest on and place 2 integrated appliances doors on the front of the appliances, as shown below. To tidy things up, you can then run some plinth across the bottom and use some filler panels either side of end panels, if there are gaps between the end panels and wall. If you are looking to hide freestanding appliances then we would advise using 2 x 347mm wide doors for each appliance, so 700mm of total width for each appliance is recommended, as freestanding washer/dryers are wider than our integrated single doors, which measure 597mm. Because freestanding appliances are deeper in size, you would also need to use a deeper worktop around 670mm in depth or deeper, so that your appliances will fit into the gap. Providing the worktop is laminate or solid wood, place end panels either side of the appliances and a baton to the rear would be enough support the worktop. As you will be using 2 x 347mm doors, you would also need an end panel between the 2 appliances, so you could hinge the 2 doors that would be in the centre of the appliances. We need to somehow incorporate space for a tumble dryer, a wachine machine, a boiler and tall space for an ironing board, hoover to once side. What would be your suggestion as to how to configure this? Thanks! Hi Robert, fitting all those items in is possible but it would depend on the space that you have. We don’t offer a design service but we do have an online kitchen planner below where you can have a go at designing your room with drag and drop units and view it in 3D afterwards. Hi, in the first picture showing both appliances side by side, is there a panel in between the appliances? Hi Rui, this was my old kitchen and no, there was no end panel in-between the appliances. 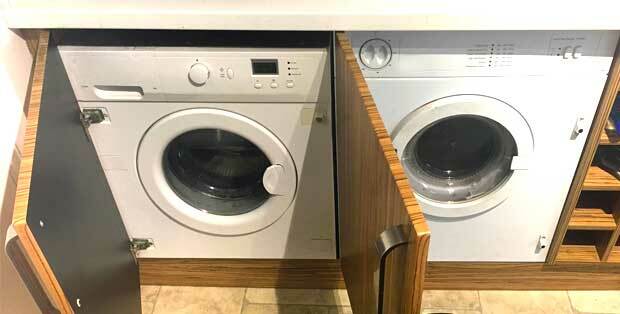 The appliances were close together and the doors were adjusted so that there was only about a 3mm gap between them so that they looked good when closed. Hi Eamon, the end panels would need securing to the floor and to the underside of the worktop to make them secure. or, you could create some batons on the wall to help secure the end panels as well. I am hoping to hide a washing machine and a dishwasher the way you have shown above. I have 2 questions. I will have washing machine, sink unit, dishwasher, 60cm cupboard. My question is will I need 4 end panels to give strength to the doors or will I be able to hang doors to the neighbouring cupboards? And also, when the washer or dishwasher needs repair, how will I access it? can the plinth be easily removed? Hi Anne, you will still need end panels on the outside but inbetween the sink unit you can use a 100mm filler panel for the hinges to attach. You definitely need something as you cannot attach the hinges to the sink unit. If you need anymore assistance on this then the sales team can help on 01977 608 418. Hello, I really like your approach to hiding freestanding appliances, and I’d be looking to do so with an inframe kitchen design like Helmsley. My question regards what happens when an appliance like a washing machine needs to be repaired or replaced in such a set-up. Can the inframe doors be removed easily? Hi Richard, the doors just clip off the blum hinges very easily and clip back on. I am currently fitting my own kitchen from you guys, I am planning on fitting my washer and drier as suggested above. I am struggling to figure out how the central end panel can have a door hinging on both sides without them interfering with each other? Is there a special hinge I should use? Hi Alex, as you build this yourself with doors & end panels and the doors come undrilled as well, it would probably best to raise the hinges slightly on 1 door and lower on the other, so that the screws have no chance of meeting in the middle panel. Your washer/dryer disgram above doesn’t look quite right, and it doesn’t match the pictures below it. The diagram shows the side panels protruding to the level of the doors, i.e. the doors hinges inside the side panels, whereas the photos show the doors hinges ober the side panels. Hi Danny, I have updated the diagram to reflect the pictures of the actual doors, fitted in a kitchen that hide the washer/dryer, which is correct. HI, can you just fit the concealed hinges to the end panel between or do you need to pack them out so they can close properly? Hi Kris, the hinges should just fit directly onto the end panel but just double check with your kitchen fitter first. Is it possible to stack integrated washing machine and tumble dryer? And how would I achieve this? I am looking at a Linwood painted kitchen. Thanks. Hi Jo, I’m afraid we don’t have any units for appliances that are stacked, as we do not recommend it as units like washing machines shake a lot and could cause the top appliance to fall. Will there be problems with the worktop weight and it resting on the two integrated appliances? Hi, the integrated appliances will never reach the worktop. From the floor to the bottom of a a worktop is usually 870mm (720mm base unit height + 150mm legs). The worktop will rest on the units that you have. As you have a unit either end and in the middle, this will be enough to take the weight of the worktop. I would also prefer to cover up non integrated appliances. Can this lookbe achieved when using quartz worktops? In your article you only mention wood and laminated worktops. Hi Marc, quartz worktops are very heavy and would ideally need the support of base units to rest it on. Hi, I am looking at an “in frame” kitchen style – the Helmsley range. There are no separate doors available for this range so the article above does not work for me. There was a suggestion of using dry-assembled 700 width units in the comments. Please can you explain this in more detail? What does dry assembled mean? What instructions would I need to give to my kitchen fitter? And would a 700 width unit work with in-frame kitchens, given that presumably the door opening would be less than 700mm wide? Many thanks. Hi, you would need to request the 700mm wide unit to come with a pair of combination doors (the door is pinned to the frame) so that the doors can be opened with the frame. There would be a surcharge for this. You would also require the unit to come dry assembled (Not glued so it can be adapted onsite). Due to the appliance depth you would need to increase the depth of the worktop that covers the unit. Usually to around 670mm deep. If you need any advice on this, our sales team will be happy to help on 01977 608 418. I’m also looking at helmsley bespoke. I’ve also come across the same issue and got around this by choosing a different door style (in frame effect), but it is not ideal. Do you think this would be very noticable? Can i please have two of the 700m units added to my basket with the combination doors (for freestanding washer and dryer) so i can decide between them? Hi Sana, if you give our sales team a quick call at 9am when they open on 01977 608 418 then they will be able to advise you on the 700mm unit and how to add it to your cart. Hi, unfortunately with free standing appliances not being made to be housed inside a unit, we do not supply a unit specifically for this purpose. You are able to use an 800mm wide unit to be dry assembled, which will need to be modified onsite by yourself, you will also need to check the depth of the appliances you are using, as you may find even after removing the back panel from the unit, the depth may not be enough and may need to be pulled forward off the wall. I want to hide just a freestanding washer and it would have a base unit at either side so do I still need 2 end panels and then the 2 doors? Also, I can’t see a appliance door in the suggested size of 347mm only in 447mm & 597mm, can you please advise the part number or where I can find these? Hi, another solution would be to order a 700 base carcase and request it dry assembled. Cut the entire base out of the unit and use it as a shell over the appliances this way the unit has some rigidity rather than trying to use panels and doors. If you are looking for 347 doors, then they are available on the doors pages 715×347. The cover up idea looks good and two doors, as you suggest at 347mm wide, are more than ample to hide a laundry appliance, however, I can’t find this size of door on your website, especially as each door would have to be 870mm in height, in order to cover the appliance from floor to worktop, as freestanding washing machines and dryers don’t have a plinth. Do you sell custom sizes of doors and also, cupboards, ordered made to measure? I’m also looking for cupboards to build a neat mantle surround, as I don’t like the bulky mantles that most kitchen suppliers offer, due to losing cupboard storage at the top of each side unit because the bulky mantles are wide and overlap the side units, causing dead space. I’d need two dresser type worktop cupboards, 300 wide, 400 deep and 1210 high, with a small drawer at the base, beneath a cupboard door, to sit on worktop at each side of my 900 range cooker. I, also, need a panelled style bridging extractor unit, with a neat mantle across the front, 1100 wide, 400 deep, to connect between the dresser units and run above the range cooker. This design of mantle gives much more cupboard storage space right to the top of each side cupboard, with a less wide mantle across only the bridging extractor unit. Can your company provide custom sized units and doors? (It’s possible to get this style of mantle from other kitchen suppliers who make solid pine kitchens). Hello Elaine, thanks for getting touch. To achieve the best look for your integrated laundry appliance, we’d recommend using a plinth. You can sit the appliance just behind this and the doors we’d suggest using would be 715x347mm. 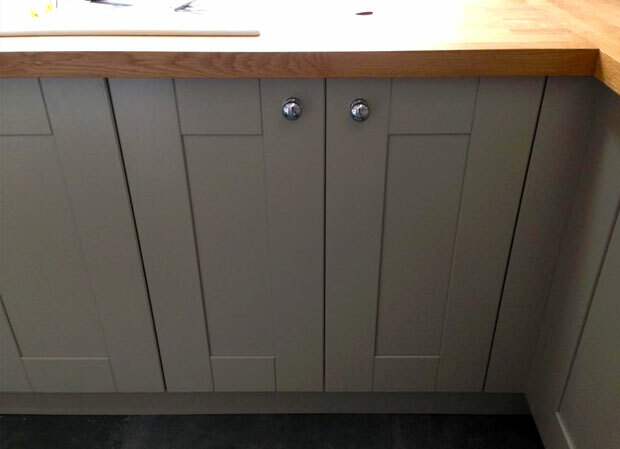 Our service doesn’t include the facility to make kitchen units or doors to bespoke sizes. However, our large choice of doors and units are manufactured in a range of different sizes and configurations, and with over 900 different units available we can usually find a suitable match. Regarding the mantle; we can only supply our normal built up mantle measuring 1800mm wide x 1210mm high x 400mm deep. This comes as standard, with two 300mm wide working units at either side; creating 1200mm of internal space. As an alternative to this, you could use two dressers and a top box spanning the opening. However, the widest top box we offer is 1000mm. You could combine our 500mm and 600mm boxes side by side, but this would look uneven and would also need to be supported from beneath.